Children with disabilities tend to have higher levels of behavior problems than other children. Such problems have implications for psychopathology in the young adult years, with possible effects on life course opportunities such as employment and independent living. 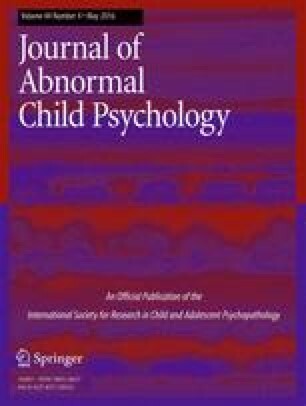 This investigation examines the developmental course of both internalizing and externalizing behavior problems by employing person-centered analyses to construct patterns of change in behavior problems in 169 children (54 % male) with early diagnosed disabilities, from age 3 to age 18. Early childhood predictors of these patterns indicated that more adverse patterns of both types of behavior problems were predicted by higher maternal depressive symptoms. Greater impacts on the family of having a child with a disability predicted more adverse patterns of internalizing behavior problems. More adaptive patterns of externalizing behavior problems were predicted by positive maternal sensitivity to a child’s distress. These findings suggest the need for early intervention focused on the family system. We thank the participants of the Early Intervention Collaborative Study. This study was supported by grant R40 MC08956 from the Maternal and Child Health Bureau (Title V, Social Security Act), Health Resources and Services Administration, U.S. Department of Health and Human Services.